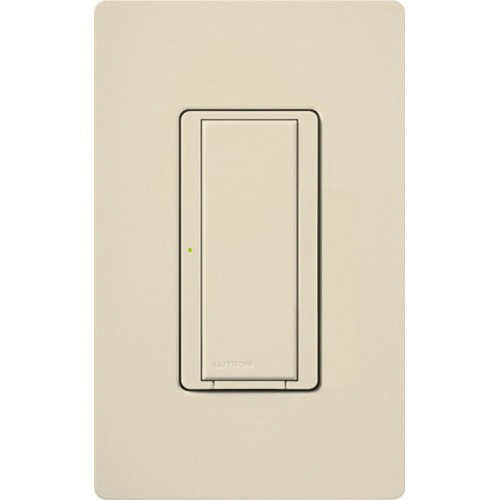 Lutron RadioRA®2 Maestro® Multi-location neutral wire electronic tap switch in light almond color, is rated at 120-Volts. Gloss finished switch with On/Off action, has a dimension of 2.94-Inch x 4.69-Inch x 1.437-Inch. Wall box mountable switch has maximum load capacity of 8-Amps for light and 5.8-Amps for motor. Switch operates at temperature range of 0 to 40 deg C. Switch is UL listed, CSA certified, FCC certified and meets NOM/IC/COFETEL/ANATEL standards.